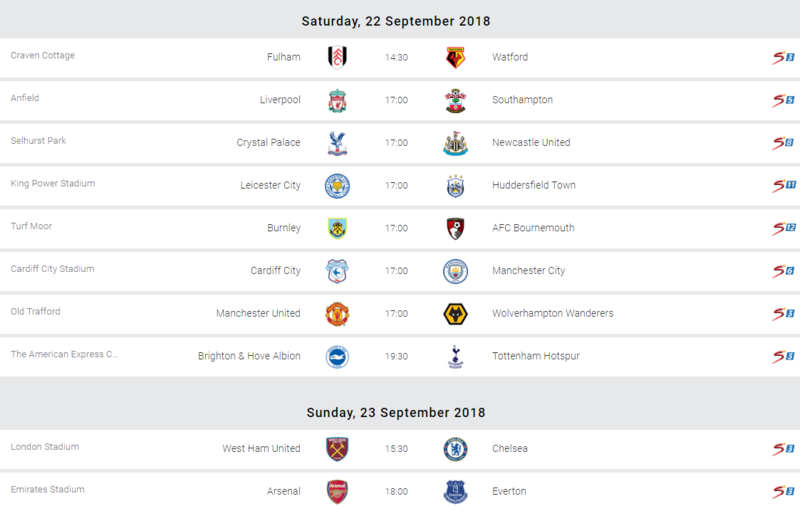 The 2017/18 Premier League surprise package-Watford will be hoping to return to winning ways when they face Fulham on Saturday. Javi Garcia’s men lost their first game of the current campaign last weekend, going down 2-1 at home to United. It was the first time they had failed to get all three points from a league game this season and will fancy themselves getting back to winning ways against a Fulham side that has lost three of its opening five fixtures including a 3-0 loss at defending champions Man City last time out. Garcia could become only the fifth manager to name the same starting line-up in their opening six matches of a Premier League season this weekend. Nathaniel Chalobah continued his recovery from a serious knee injury by playing in an Under-23 game on Monday but he is not expected to feature. For Fulham, captain Tom Cairney remains out with the ankle injury which caused him to miss the defeat by Manchester City. Defender Tim Ream is back in training after a pre-season back problem but will not be involved. Watford are unbeaten in the past four meetings and could earn a third successive win over Fulham in all competitions for the first time. Fulham have failed to score in their last three games against Watford, which include a 5-0 Championship defeat at Craven Cottage in December 2014 when Slavisa Jokanovic was in charge of the Hornets. Fulham and Watford are in the top flight together for only the second season. They drew both league fixtures on the previous occasion, in 2006-07. Burnley have had a terrible start to the new campaign. They are one of four teams still searching for their first victories and by the kick of the first ball on Saturday, the Clarets sit bottom of the league. However, they will be fancying their chances against a Bournemouth side that has only defeated them once in the last 15 fixtures. Burnley’s joint record signing Ben Gibson had minor hernia surgery on Thursday and is expected to be ruled out for at least another fortnight. Steven Defour and Robbie Brady are both nearing a return from long-term knee injuries but will not play on Saturday. Charlie Daniels could miss out again with a knee problem, while Kyle Taylor has a calf injury and is also a doubt for the visitors. Junior Stanislas might be involved for the first time since suffering knee ligament damage six months ago. Bournemouth earned their first competitive win at Burnley on the final day of last season – at the 15th attempt (D6, L8). Both sides have scored in each of their four Premier League meetings, totalling seven goals apiece. Pep Guardiola will be back on the touchline as his European ban does not apply in the Premier League. The Spaniard could only look on from the stands as his side lost 2-1 at home to Lyon in the UEFA Champions League on Wednesday night. City’s opponents-Cardiff are yet to master a league victory this season and have gone on to lose three of their opening five fixtures. They will have to do well against a much-fancied City side that sits third on the log with 13 points from a possible 15. These two sides met in an FA Cup fourth-round tie last season, with Manchester City recording a 2-0 away win. Cardiff won 3-2 in their only previous Premier League home fixture against Manchester City, in August 2013. City go into the game winless in six top-flight away fixtures against Cardiff since a 3-0 victory in January 1954. The last 10 meetings in all competitions have produced an average of 3.5 goals per match. Cardiff City manager Neil Warnock will assess the fitness of several players who are carrying niggling injuries or have been affected by a virus. Harry Arter returns after illness but Aron Gunnarsson has suffered a setback in his recovery from a knee injury. There could be a Manchester City recall for Sergio Aguero, who was named on the bench against Lyon, but Benjamin Mendy is absent with a bruised metatarsal. Kevin de Bruyne, Eliaquim Mangala, Danilo and Claudio Bravo remain out. Crystal Palace remain without injured striker Christian Benteke, so Jordan Ayew is again expected to start. The trio of Scott Dann, Connor Wickham and Pape Souare are still unavailable. Newcastle captain Jamaal Lascelles was substituted last weekend with a recurrence of an ankle problem but he is fit to play on Saturday. Jonjo Shelvey could make his first start since returning from a thigh injury, while Salomon Rondon, Kenedy and Ki Sung-yueng may be recalled. Crystal Palace have won one and lost 10 of their last 15 matches in all competitions against Newcastle. However, Newcastle are without a win in three league games at Selhurst Park (D2, L1). The Magpies have only failed to score in one of the 14 Premier League meetings. Leicester’s suspended captain Wes Morgan is likely to be replaced by Jonny Evans, although summer signing Caglar Soyuncu could also deputise. Midfielder Matty James is still out after Achilles surgery. Huddersfield captain Jonathan Hogg is available again after serving a three-game suspension. Defender Erik Durm has recovered from a minor back problem but midfielder Ramadan Sobhi remains sidelined with a knee injury. Leicester have won their past seven home league games against Huddersfield. Huddersfield have not won any of the last nine league meetings since 1995. Leicester won 3-0 in last season’s corresponding fixture. Liverpool go into Saturday’s Premier League fixture on cloud 9 after winning 3-2 at home to PSG in the Champions League. In doing so, manager Jurgen Klopp became the first Red’s tactician to win all his first six competitive fixtures at the start of the season. For Southampton, thay have had an inconsistent start to the current campaign, losing two of their first five games en route to getting five points. Liverpool will be thrilled with the news that striker Roberto Firmino is fully recovered from the eye problem which led to him starting on the bench in the midweek Champions League win. Dejan Lovren is nearing full fitness after a pelvis injury but will not feature, while Divock Origi, Dominic Solanke and Adam Lallana are also out. Southampton must do without on-loan top scorer Danny Ings, who is ineligible to play against his parent club. Fellow forward Manolo Gabbiadini faces a fitness test on a hamstring injury. Man United continued their fine run of form with a 3-0 win at Young Boys in their mid-week European fixture. The victory on Wednesday means that Jose’s charges have now won all their last three competitive fixture after losing two of their first three. Wolves on th other hand are enjoying the return to Premier League football, winning two of their first five whilst losing only one. Their brilliant start has seen them sit only a point and place behind United in the league placings. United go into the game with several issues as Marcus Rashford and Nemanja Matic are suspended while Ander Herrera and Marcos Rojo are not yet considered fit enough to feature. Phil Jones could return from a hamstring problem, while Jesse Lingard and Antonio Valencia are likely to play after being rested in midweek. Diogo Dalot impressed on debut against Young Boys but his next start is set to come on Tuesday in the Carabao Cup. Wolves could name the same starting XI for a sixth consecutive league game. Ivan Cavaleiro is expected to be their only absentee as he continues his recovery from a back injury. Wolves’ most recent away victory against Manchester United came in the top flight on 9 February 1980, when Melvyn Eves scored the only goal. They have lost their last eight league and cup games away to the Red Devils. Midfielder Pascal Gross, who is nursing an ankle injury, remains Brighton’s only absentee. Winger Jose Izquierdo and forward Florin Andone are awaiting their first appearances of the season after returning to fitness. Tottenham will assess Dele Alli and Moussa Sissoko, who have returned to training after respective hamstring and knee problems. Hugo Lloris is still injured so Michel Vorm will start in goal. Toby Alderweireld and Kieran Trippier will return to the squad after being rested in Tuesday’s Champions League defeat at Inter Milan. Brighton’s last win against Tottenham was by 2-1 at home in the top flight in April 1983. Spurs are unbeaten in the subsequent four meetings in league and cup (W3, D1), although the only encounter on the south coast was last season’s 1-1 draw. Tottenham have failed to score in just one of their previous 15 matches against Brighton in all competitions. Fresh from a 1-0 win away to PAOK in the Europa League, Chelsea will hope to maintain their fine start to the league. The Blues have been in scintillating form, winning all their first five games and in the process, setting the early pace. They will look at star player-Edin Hazard who is topping the scoring charts with five goals already. However, they will hope to better their recent record against a side that has won three of its last six home games against Maurcio Sarri’s men. Pedro, who sustained a shoulder injury in Thursday night’s victory at PAOK, is a major doubt for the game. Mateo Kovacic may also miss out with a minor injury. For the Hammers, Javier Hernandez (flu) is a doubt, while Jack Wilshere (ankle) is sidelined after surgery. Andy Carroll, Manuel Lanzini and Winston Reid remain long-term absentees. West Ham have won three of their last six Premier League home games against Chelsea (W3 L3), this after previously enduring a six-game winless run (D1 L5). The Hammers ended a 11-game run of conceding against Chelsea at home in the league when they won 1-0 in December – they last kept successive clean sheets at home versus the Blues in August 1969. Only Arsenal (123) have won more Premier League London derbies than Chelsea (121), while West Ham have lost more than any other side in the competition (95). West Ham are without a win in a Premier League London derby since beating Chelsea in December; since then they’ve drawn four and lost two. Chelsea are looking to win their opening six games to a Premier League campaign for the third time (after 2005-06 and 2009-10) – no other side has done it more than once in the competition. The Blues have won the league on both previous occasions they’ve won their first six. Arsenal manager Unei Emery is likely to recall a number of first-team regulars for Arsenal’s Premier League clash at home to Everton on Sunday. The Gunners head coach made eight alterations for Thursday’s 4-2 Europa League win over Vorskla Poltava but the likes of Petr Cech, Aaron Ramsey, Mesut Ozil and Alexandre Lacazette will be pushing for returns. Laurent Koscielny (Achilles), Sead Kolasinac (knee), Ainsley Maitland-Niles (leg) and Carl Jenkinson (ankle) remain absent. For the visitors, Defender Yerry Mina could come into contention for his debut after a full week of training following a foot problem. Fellow centre-back Phil Jagielka should be ready to train with the squad again next week following a knee injury but Andre Gomes (hamstring) and Seamus Coleman (foot) remain sidelined. Arsenal are unbeaten in 24 home matches against Everton in all competitions (W20 D4) since a 2-1 Premier League defeat in January 1996 under Bruce Rioch. Everton have played more Premier League matches at the Emirates without winning (12 – W0 D4 L8) than any other club. Arsenal have scored more Premier League goals against Everton than any side has managed against another in the competition’s history (105). 49 different players have scored a Premier League goal for Arsenal against Everton – the only side to have more against an opponent in the competition are Chelsea (52 vs Spurs). The Gunners have won more Premier League points in the month of September than any other side in the competition (199). Both of Everton’s away Premier League games this season have finished 2-2, with the Toffees leading in both matches.